Hi there! I’m G.R., writer, poet, artist, and creator of “Internal Hero”. I’m a first time participant of the 30 Characters Challenge. Out of a life long passion for the genre, creating a comic hero universe is an endeavor of which I’ve shared victories, triumphs, and challenges over the past year on Twitter (@Retrospect360) . 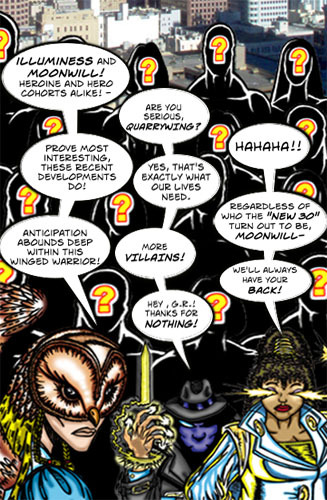 One triumph was launching the first tales of this universe chronicled in the webcomic “Internal Hero Presents” beginning with the adventures of “Moonwill”. 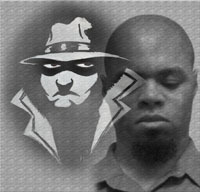 Another, the creation of Internal Hero’s 40th character on April , 3rd 2011. Once seeing a fellow webcomics creator tweet the information link for the 30 Characters Challenge I soon realized that I must be a part of it. I asked myself: “It took me a year to craft the first 40 characters of Internal Hero- could I really push myself to create a brand new, additional 30 characters in 30 days? Could I really meet that challenge?” Yes, I believe I can. It is easily one of the most exciting events I’ve heard about on Twitter and I’m eager to participate! 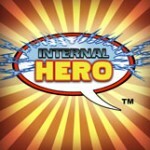 The Internal Hero Universe is about to get a whole lot bigger as I add another brand new 30 characters to the fold. 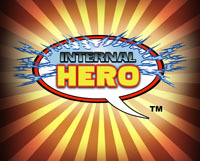 I look forward to creating Internal Hero’s “New 30” during the challenge! Best wishes and creative energies to all the participants. Hey, welcome aboard! 🙂 I found your comic a month or so ago and I really like where you’re going with it. Looking forward to seeing the characters you make. Wonderful choice of words- I love that! ” Your Mission:Possible. Should you choose to accept it.” Yes, I choose to accept it. 🙂 Thank you for the positive energy!